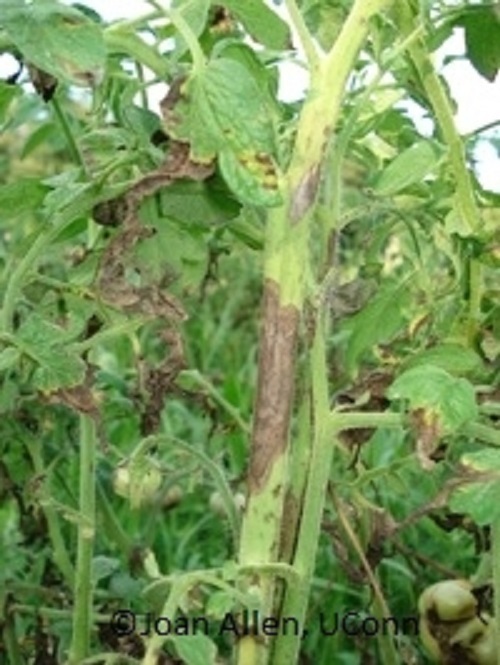 Late blight of tomato and potato is caused by the fungus-like pathogen Phytophthora infestans. When outbreaks of this disease occur, entire crops can be lost. Late blight is the disease that was responsible for the Irish potato famine in the mid-1800s that resulted in the death of hundreds of thousands of people and the emigration of many Irish people to North America. 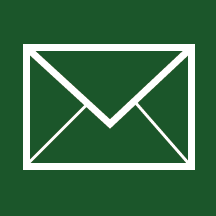 More recently, outbreaks of late blight have occurred in the northeastern United States. In 2009, the disease was widespread due to the introduction of the disease into the area early in the season and favorable weather conditions. This outbreak created a much greater awareness of this disease among home gardeners as well as commercial growers. 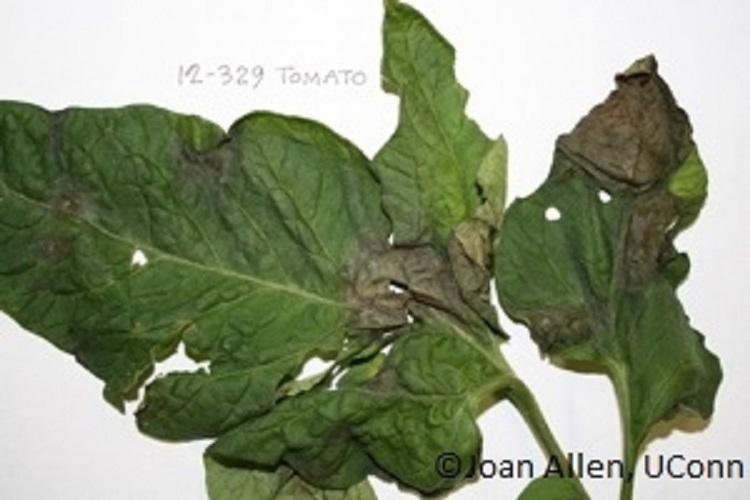 Tomato and potato are the important crop plants affected by late blight. Some other plants in the Solanaceae family are also susceptible including petunia and some species of nightshade. Infection and symptoms can occur on leaves, stems, tomato fruit and potato tubers. Leaf lesions begin as small necrotic or water-soaked spots that enlarge to form brown lesions or blotches, eventually killing the leaf. The lesions may or may not have a yellow or chlorotic border. Stem infections result in dark brown lesions that have well-defined edges. On tomato fruit, brown lesions are firm and may have a rough or bumpy surface. 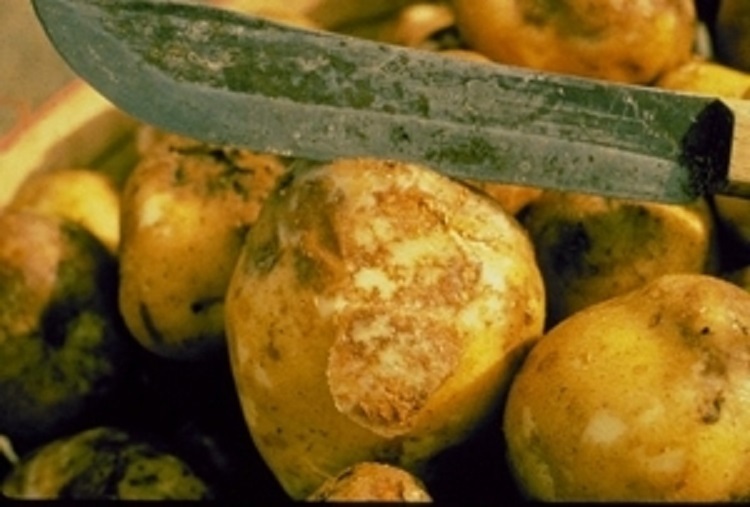 When potato tubers are infected, the inner fleshy tissue becomes mottled with a reddish-brown discoloration and the surface will have shallow discolored lesions. See photos of symptoms below. Late blight leaf lesions on tomato (left) and a tomato stem lesion (right). During humid or rainy weather, a white coating of spores will be produced on the lower surface of infected leaves, on the surface of stem and fruit lesions and on the outside of infected potato tubers. These spores (shown below) are spread by wind, wind-driven rain, and splashing water. White sporulation of P. infestans on the lower surface of a tomato leaf (left) and a close-up of the lemon-shaped sporangia (right). Sporulation and spread will not occur under hot or dry conditions. Phytophthora infestans does not overwinter in our area. It only survives in living plant tissue. In the northeast, P. infestans can overwinter on infected potato tuber tissue that does not freeze or on plants in greenhouses. Infected potato tubers in the ground or in cull piles that do not freeze can produce infected volunteer plants in the spring. Spores on these plants can provide a source of early season inoculum. Another method of introduction early in the season is on infected transplants. In 2009, infected transplants were sold at a number of retail outlets, introducing the pathogen into the environment. When this was followed by weather favorable for disease development and spread, a widespread outbreak occurred. 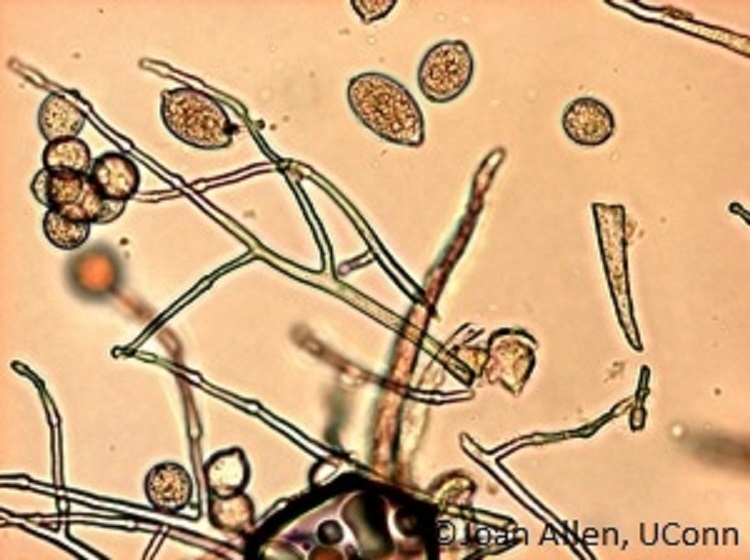 Typically, spores move north on wind currents from the south where tomatoes are grown year-round and the first late blight infections in the northeast are noted later in the season. This pathogen is not seed-borne so seed from infected plants can be used for subsequent seasons. Potato tubers become infected when sporangia are washed off infected leaves into the soil. Tools for management of late blight include the use of clean seed potatoes and healthy tomato transplants, resistant varieties, monitoring for disease, cultural practices, sanitation and fungicides. Use resistant varieties and clean seed potatoes. When purchasing seed potatoes, look for those that are certified disease-free and plant only blemish-free tubers. Purchased tomato transplants should be free of any leaf or stem lesions and should appear healthy and vigorous. There are varieties of both tomato and potato that have some resistance to late blight. Monitor your plants throughout the season for late blight symptoms and signs (sporulation). 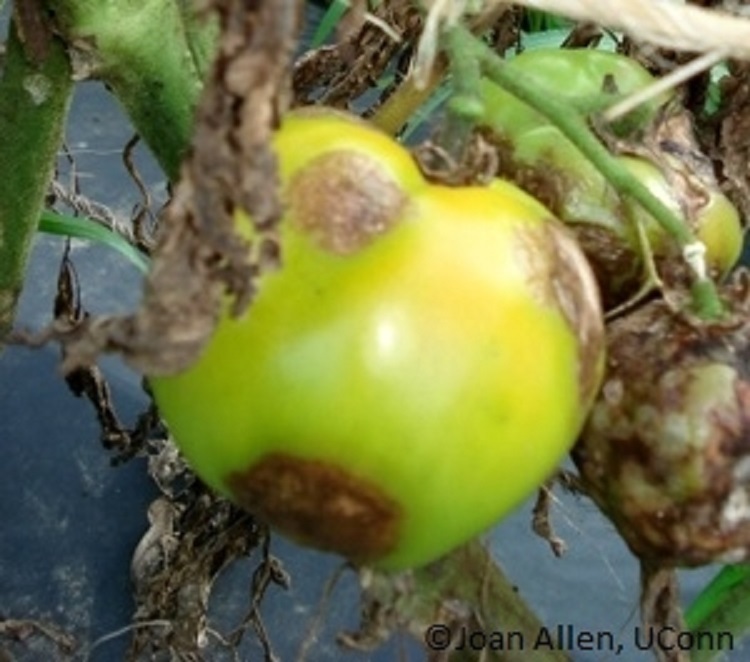 If late blight is detected early, fungicides may help prevent new infections and spread. When a plant becomes infected, it should be destroyed by tilling it into the soil well or by disposing of it in the trash. Cultural practices that can help reduce late blight and other foliage diseases include those that reduce the amount of time leaves and other plant surfaces are wet. A film of water on the plant surface is required for a spore to cause an infection. Create good air flow around the plants by using ample between-plant spacing and staking and pruning indeterminate varieties. Avoid overhead irrigation or, if it is used, water early in the morning. To prevent potato tuber infection, hill the potatoes to create a greater barrier between infected leaves and the developing tubers. Sanitation, or removal of infected plant material, is important during the growing season because it reduces the number of spores or inoculum that can cause infection in neighboring gardens and farms. In potatoes, it is important to prevent infected tuber tissue from becoming a source of early-season inoculum the next season. Make sure any composted potatoes are thoroughly rotted and destroy any volunteer plants. 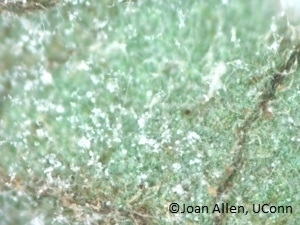 Fungicides are sometimes necessary to manage or prevent late blight. For home gardens, all available options are preventative so they must be applied before infection occurs. A number of products including biological controls, biorational products and traditional chemicals are available. Commercial growers should use a combination of protective and systemic fungicides. When weather is favorable, regular applications will be necessary. When using pesticides, always read and follow all label instructions carefully.